MANILA, Philippines - Super Typhoon Lando (international name: Koppu) has made landfall over Casiguran, Aurora at 1:00 am and has remained almost stationary, state weather bureau PAGASA said on its 5:00am weather update on Sunday, October 18, 2015. The U.S. military's Joint Typhoon Warning Center (JTWC) upgraded Koppu to a super typhoon level, typhoons with maximum winds of at least 150 mph, equivalent of a Category 4 on the Saffir-Simpson Hurricane Wind Scale in its 11 a.m. EDT advisory Saturday. "Lando is the strongest landfall in Luzon in five years. The most ominous threat for the Philippines, however, should be its prolific rainfall as it grinds across the mountains and valleys of Luzon, the main island of the northern Philippines and home to almost half of the country's 98 million people", weather.com reports. At 4:00 AM today, the eye of Typhoon Lando was located based on all available data including Subic Doppler Radar in the vicinity of Casiguran Aurora (15.9°N, 121.8°E). It has maximum sustained winds of 175 kph near the center, gustiness of up to 210 kph and forecast Movement: Forecast to move West at 3 kph. Public Storm Warning Signal No. 4 (171-220 kph Expected in 12hrs.) is still up in Aurora. 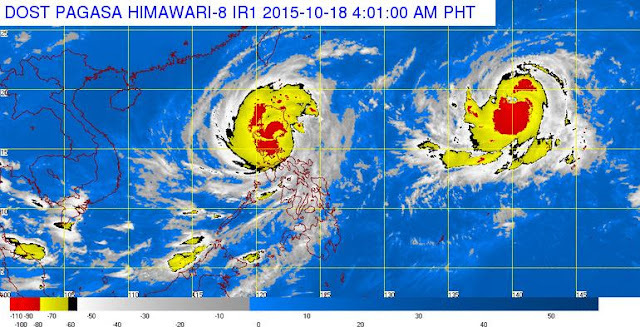 Storm surge may reach to a maximum of 3 - 4 meters in this region and neighboring provinces. Public Storm Warning Signal 3 (121-170 kph Expected in 18hrs. ): Isabela, Quirino, Nueva Vizcaya, Nueva Ecija, Ifugao and Northern Quezon including Polillo Islands. Public Storm Warning Signal 2 (61-120kph Expected in 24 hrs. ): Cagayan including Calayan and Babuyan group of Islands, Benguet, Mt. Province, Kalinga, Apayao, Pangasinan, Tarlac, Pampanga, Bulacan, Rizal, rest of Quezon and Metro Manila. Public Storm Warning Signal 1 (30-60kph Expected in 36 hrs. ): Zambales, Ilocos Norte, Ilocos Sur, La Union, Abra, Camarines Norte, Bataan, Cavite, Laguna, Batangas and Batanes. The estimated rainfall amount is from heavy to intense within the 600 km diameter of the typhoon. Fisherfolk are advised not to venture out over the seaboards of Luzon, Visayas and the northern and eastern seaboard of Mindanao. Occasional rains and gusty winds will be experienced over provinces under PSWS #1 while those under PSWS #2, #3 and #4 will have stormy weather. Residents in low lying and mountainous areas of the provinces with PSWS are alerted against possible flashfloods and landslides. Wave height in open sea may reach up to 14 meters or higher.